The 2016 Reality of Aid (RoA) Report, to be launched in November 2016, will focus on the theme “Technical Cooperation and Capacity Development as an Aid Modality” (see the attached thematic statement). This guidance note is for authors of the chapters for this Report. Technical cooperation remains one of the most heavily used forms of aid, accounting for between a quarter and a half of all ODA. However, to date it seems that technical cooperation remains largely insulated from donors’ efforts to improve the quality and effectiveness of their aid, largely ignoring the principles of democratic ownership and partnership. What are the preconditions for technical assistance that is country-driven and country-owned? How much of donor technical assistance remains tied? How can contributions of technical cooperation for infrastructure development be consistent with human rights based approaches and the country’s sustainable development objectives? In what ways can South-South technical cooperation be equitable and mutually beneficial? The 2016 Report will take stock of technical cooperation at national, regional, and global levels, in their many varied forms. It will draw lessons from the positive and problematic practices, and develop key messages on the preconditions and principles for the contributions of technical cooperation to development effectiveness for the reduction of poverty and inequality. An Introductory Political Chapter will be authored by the International Coordinating Committee (ICC), setting out the overarching analysis and messages that follow from contributions to the Report. 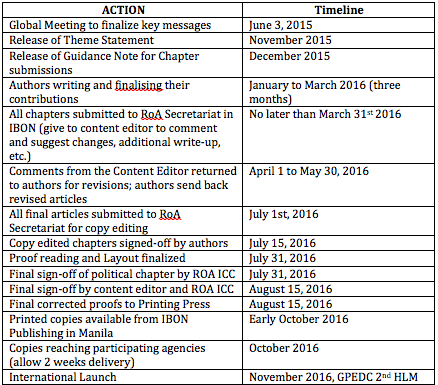 Thematic chapters The RoA ICC has developed and approved a theme statement for the 2016 Report (see Annex One). The Report will be organized by Sub-Theme Areas, derived from this thematic statement, grouping the different thematic chapters that we receive. Each Sub-Theme area will begin with a short introduction that identifies key messages related to that sub-theme, authored by the International Coordinating Committee. Members of the Network will be asked to contribute chapters related to one or more of these sub-themes. These chapters (approximately 3 or 4 under each sub-theme) may be country case studies or broader analytical pieces on the theme. Authors from any region (Asia-Pacific, the Americas, Africa, OECD Countries) may contribute to a sub-theme area. The ICC will assure that each sub-theme will have contributions from different regions. The proposed Sub-Themes and some possible research questions (intended only to stimulate reflection, not necessarily all to be answered) are below. We note the strong overlaps and connections between the thematic areas. • Has technical assistance been used as a form of ‘soft pressure’ to unduly influence developing countries’ policy options? • How well integrated with national development strategies are technical cooperation initiatives from bilateral donors? • Under what conditions can the process for identification and employment of technical assistance in project design, terms of reference, procurement, reporting, and monitoring and evaluation be transparent, accountable, country-determined, and not donor-driven? • Based on examples and evidence of MDBs in particular developing countries, are recipients of this technical assistance free to decide, plan, and sequence their economic policies to fit with their own development strategies? • What conditions are important to avoid and/or promote in the use of technical assistance to facilitate country-determined priorities in policy-making processes in MDB programs for reforms? • What are the preconditions for technical assistance that is country-driven and country-owned in the context of projects whose aim is trade promotion and/or infrastructure development? • What is the degree to which information on technical cooperation is transparent and open to public participation? To what degree is infrastructure-related technical assistance tied to donor country procurement? • How do we ensure that contributions of technical cooperation for infrastructure are consistent with human rights based approaches and the country’s sustainable development objectives? • How can donor-supported trade-related technical assistance be accountable to recipient countries’ sustainable development needs and priorities? • How can technical cooperation in infrastructure contribute to positive development outcomes, and particularly goals to reduce poverty and inequality? • How do bilateral donors procure and employ technical assistance in their aid modalities, particularly with the poorest countries? What is the impact of continued tied aid on the effectiveness and cost of technical assistance? • Are technical assistants directly accountable to donors, and not local government counterparts? • What policies can be put in place to enable greater participation of nationals in contracts for technical cooperation projects? • What do country experiences say about the impact of technical cooperation, and in particular donor-determined capacity development approaches and efforts, on poverty-focused outcomes for aid? • In what ways can South-South technical cooperation be equitable and mutually beneficial? • How do recipient countries apply its country systems and standards to SSC projects as appropriate to their priorities and needs? • What lessons can be drawn from South-South technical cooperation and capacity building, including from other stakeholders such as civil society? • How can SSC take capacity development to the grassroots and contribute to the empowerment of the poor and marginalized to claim their right to development? • Is tied aid in the context of South-South technical cooperation any different than traditional North-South tied aid? A Global Aid Trends Chapter will review overall trends in aid flows, as well as, particular trends that are relevant to the theme for the 2016 Report. OECD Country Chapters will be authored by the national contact point for the Reality of Aid in each of the OECD aid providing countries. As in previous Reports, these chapters will briefly summarize issues relevant to changes in aid policy in these countries, as well, as issues related to the theme of the 2014 Report. Please note that OECD country members are encouraged to write or seek out thematic contributions to the Report in addition to preparing their country chapter. BASIC Chapters. As with the 2014 Report, the 2016 Report will also seek out chapters from the BASIC group (Brazil, South Africa, India and China) aid providing countries, which offer the opportunity to explore in more depth country specific trends in South-South partnerships as well as the Report’s theme. RoA’s regional representatives on the ICC will seek and identify authors for these country chapters. How and to what extent do these South-South partnerships differ from those between Development Assistance Committee (DAC) donors and developing countries? How do SSC aid providers change the development landscape, drawing lessons from their own development experience, in terms of promoting technical cooperation that truly caters to the real needs and priorities of partner countries? An Abridged Version will accompany the Global Report. This abridged version will include the main advocacy chapters – the Political Chapter, the Introduction Section for each Sub-Theme Area, and the Global Aid Trends Chapter. It will adopt a user-friendly format and be available for wide distribution at launches and advocacy events relevant to the theme of the 2016 Report. Thematic chapters should be no longer than 3,200 words and OECD chapters approximately 2,800 words (not including footnotes). Many people in our target audiences are busy and if you can briefly make a cogent documented analysis, with conclusions, there is more chance it will be read. All chapters for the Report will be posted on the Reality of Aid site and will be individually downloadable. Style Please remember that many readers, including some of the policymakers we are trying to influence, will not be specialists on aid, development, or poverty. Try to avoid jargon. English is not the first language for many readers. Keep sentences simple and short. Use short actual examples and illustrations where you can. Make your case using facts rather than rhetoric. We are looking for a style that is accessible, not academic. Summary bullets for OECD chapters The OECD country chapters can summarize key points about recent trends in their country’s ODA as bullets at the beginning of the chapter (see the 2014 Report link above for examples). Anchoring chapters in reality and experience Chapters analyzing a sub-theme area should be anchored with some specific illustrations. For example, an author could give an overview of what is happening in one developing country or a region in relation to the theme, or authors could focus on some specific aid providers and how their policies translate into reality. Experiences of developing country governments, communities and civil society organizations reflecting the interests of people living in poverty in relation to issues of technical cooperation are particularly relevant. If you have other ideas on how to explore the issues, please talk either to your regional International Coordinating Committee Representative or the RoA Secretariat (see below). References A lot of the credibility in RoA rests on the fact that it is written mainly by CSOs who work directly with people in poverty and who can see how aid and development finance policies and practices translate into reality. The more RoA can make its case using specific examples from grassroots experience, the better. • Please include the following information in a bibliography. For books please give: Author (organisation or individual author), Title, Publisher, Year and Place of publication and Web URL if available. For articles in journals please give Author (organization or individual author), Title, Journal Name, Volume and Issue Number, Date of publication and Web URL if available. • Endnotes should be used sparingly to add additional information relevant to the point being made in the text. • If you include graphs, please indicate in the graph the data sources for the graph..
• Please number and give a title to all graphs, tables or other illustrations and provide these graphs/tables in an excel format, not as a picture embedded in the text (to enable layout for the publication). If you are referring to specific organisations (a donor agency or a government department or a corporation) can you use the writing process to build dialogue or to debate the issues? Where possible, it is useful to contact those concerned to ask for information, to get their perspective. If you are commenting on the work of another agency, it is only fair to give them the chance to comment on what you are saying. This ensures that facts are correct and provides the chance to have a substantive discussion. Of course taking this approach is time consuming and can be challenging especially if you are taking a critical line. But dialogue gives you the chance to make your case directly to the people concerned and may strengthen your case. Ideally, chapters in RoA should not merely comment on what is wrong, but should also offer ideas on how things could be done better. Open-minded policy makers are often quite receptive to specific ideas that are within their remit and that they can actually implement. So if possible, please include any specific positive recommendations for change. In the introductory Political Chapter, the International Coordinating Committee will be putting forward the key advocacy messages on the theme and there will also be messages identified for each of the Sub-Theme areas. All chapter should be submitted to the Managing Editor, Erin Palomares, in the RoA Secretariat at IBON in the Philippines (epalomares@realityofaid.org), and copy to secretariat@realityofaid.org. She will forward the chapter to the Content Editor for the Report (Brian Tomlinson), who will read and provide feedback on each chapter, with suggestions for edits and clarification of content. Authors will have an opportunity to respond to these suggestions and then the Managing Editor will seek a final sign-off for publication. We hope that this explains the steps in developing your contribution to the 2016 Report. If you have any questions or comments, or if we can help in any way at all, please don't hesitate to get in touch. We would be really pleased to see early outlines of chapters or just notes on what you plan to cover. This would help us make connections between different authors and perhaps suggest ideas that could help in producing chapters. The plan is to have the Report available for distribution to the Network by the first week of November 2016. To this end, we have developed the timetable below for the different stages of the Report. Please make every effort to respect the timetable, as there is considerable work entailed in editing and preparations for publication to have a report available in November 2016. This schedule for the RoA 2016 Report is based on experience of previous reports. The overall timetable relies on authors sending in their draft chapters not later than the dates shown. If at all possible, it would be helpful if people can send in chapters earlier to assist in scheduling editing. • Final deadline for sending chapters to the RoA Secretariat/International Coordinating Committee - March 31st, 2016. • Authors receive comments between April 1st and May 30th, 2016 for possible revisions and acceptance of changes made. The RoA International Coordinating Committee has engaged Brian Tomlinson as content editor who will review each chapter and make proposals for revisions to assure that the arguments are clear and consistent. • Authors need to return their final chapters to the RoA Secretariat for copy editing by June 15, 2016. • Authors receive and sign-off copy edited chapters by July 15, 2016. • Printed RoA 2016 Report received by participating agencies by October 2016. • International launch of ROA 2016 Report during the GPEDC 2nd HLM in late November 2016. Please contact Erin Palomares, with the RoA Secretariat, hosted in IBON International Foundation (Manila), at epalomares@realityofaid.org, copy secretariat@realityofaid.org, to discuss any aspects of the 2016 Report.